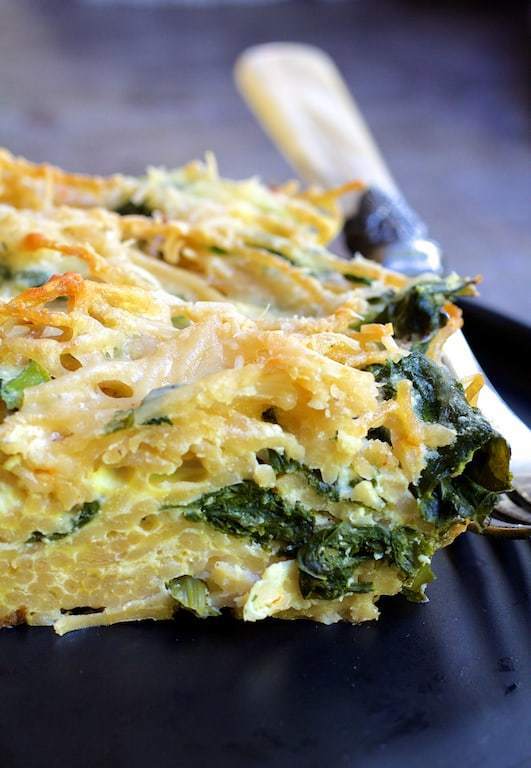 Baked Spaghetti Frittata with Broccoli Rabe, Bacon and Three Cheeses is a delicious combination of flavor and texture! Perfect for brunch, lunch or supper. Preheat oven to 350 degrees. Lightly oil a 13 x 9-inch baking dish with some of the olive oil. Bring a large pot of water to a boil, add salt and cook pasta until al dente. Drain in a colander and immediately rinse with cold water, drain again and toss with a tablespoon of olive oil. Set aside. Heat remaining olive oil in a large sauté pan over medium-high heat. Add the broccoli rabe and cook, tossing with tongs, until just wilted, about 2-3 minutes. Add the garlic and stir. Let cool. Beat eggs in a large bowl. Add ricotta and beat until fairly smooth. Add cooked spaghetti, broccoli rabe, black pepper to taste, 1 cup shredded smoked cheese, 1/2 cup Parmesan, bacon, crushed red pepper flakes and 1/2 teaspoon salt and mix well. Transfer to the prepared baking dish. Top with remaining cheeses. Bake 25 to 35 minutes or until heated through and spaghetti is starting to brown in places. Cut into squares and serve.